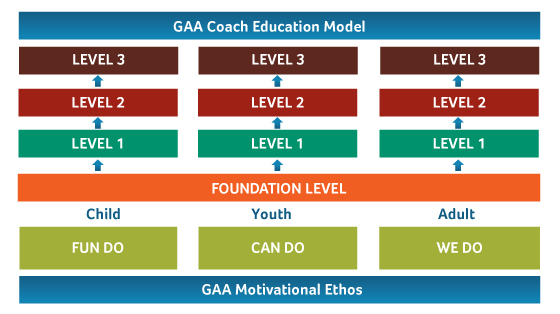 The Foundation Award is the introductory award for coaches of Gaelic Games. The course is aimed at beginner coaches and will enable participants to assist a coach in the organisation of activities to develop Gaelic Football. If you are interested in completing this course places are limited and must be booked in advance by contacting Lorraine on 043 3345 219 ASAP. We are looking at the possibility of running an Award 2 Youth/Adult Football Coaching Course in the early part of 2018. The course will be run through Leinster GAA with us providing the facilities and will cost €150. Click this link for a DRAFT (NOT Confirmed) schedule outlining the time commitment that is required to complete the course. As you will see there are 10 sessions spread over a 5 month period so this is something that if you wish to do you will have to prioritise that you can attend every session as this course will not be run anywhere else inside our catchment area so attending a session in some other County will NOT be an option. In order for us to be able to host this course we would need 24 participants and we would need to confirm the schedule by the end of October so as to give all participants the opportunity to put plans in place to ensure they can attend all sessions. So at this end I am asking that if you are interested in doing the course to contact the office on 043 3345219 with the below information. If you have any questions give call Damien on 087 912 6556. Longford GAA are running Safeguarding 1 – Code of Ethics Basic Awareness/Child Protection. We have no plans to run any more of these workshops. If anyone is still interested in completing the course please contact Lorraine on 043 3345 219 ASAP and your name will be added to a list and if there is demand then we will run another course. The workshop costs €10. This workshop is for the benefit of everyone involved in children’s sport (children, parents/guardians, sports leaders’, etc). It provides introductory information on codes of conduct, bullying, recruitment, etc. as well as child protection guidelines. By following the principles, policy and practical guidelines contained in the Code, sports leaders are playing their part in providing a safe and enjoyable environment in which children can learn and thrive. If you are not aware any person interacting with children/teenagers within the context of the GAA must have completed this course. Therefore it is imperative that if some of your coaches or even parents who give other kids a lift to games etc does not have this course then, in order to protect both themselves and your club, they should be doing this. Leinster GAA in partnership with Sports Webinars have developed a number of online workshops which are now available to watch through their Youtube channel. Please see details of the Webinars below and the links to follow to access them.